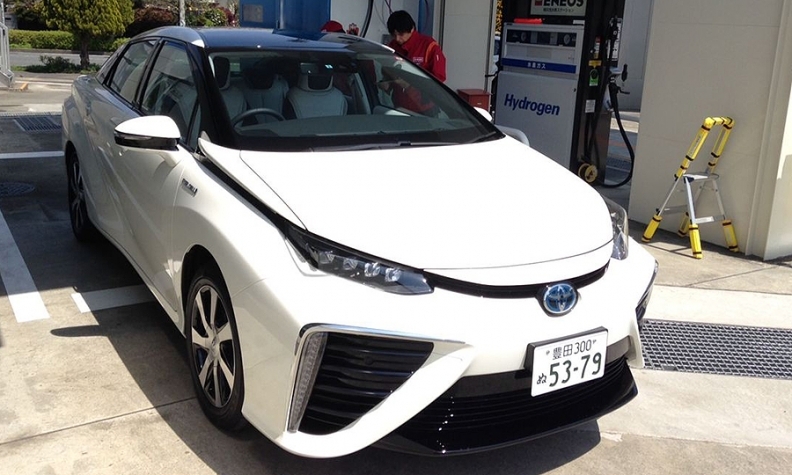 The Toyota Mirai is the world's only mass-market fuel cell car. SAN FRANCISCO -- Toyota Motor Corp., seeking a smooth debut this fall for its Mirai hydrogen car, said it will initially sell the car through just eight dealerships in California. Four of the chosen dealerships are in the Bay Area: San Francisco Toyota, Roseville Toyota, Stevens Creek Toyota and Toyota of Sunnyvale. The other four are near Los Angeles: Longo Toyota, Toyota Santa Monica, Toyota of Orange and Tustin Toyota. Rather than having the dealers stock the Mirai, Toyota will have customers request one online and complete the deal at the dealership of their choice. Toyota plans to sell about 3,000 Mirais by the end of 2017. In a statement, Toyota said the eight dealerships were chosen partly based on their expertise in selling high-tech cars such as electric vehicles and hybrids. Moreover, all of them are close to hydrogen fueling stations. Hydrogen stations remain expensive to build and difficult to find, posing an obstacle to Toyota, which is betting on hydrogen fuel cell vehicles rather than battery-electric vehicles as the clean, efficient cars of the future. The U.S. has only about a dozen publicly accessible fueling stations, according to a U.S. Department of Energy database. Most of the pumps are in California, where the state government has awarded grants for the construction of fueling stations that cost more than $1 million apiece. The state's 11th station, capable of refueling 25 cars per day, opened in March in a government parking lot in the Los Angeles suburb of Diamond Bar. Last year, Toyota lent more than $7 million to the startup FirstElement Fuel Inc., which plans to build 19 stations in California this year. Toyota is also working with French industrial-gas company Air Liquide to develop a network of stations in the Northeast.